We have already seen cool free program to flip or rotate videos. MJPEG Lossless Rotate is another similar program specifically for MJPEG videos created using digital cameras. It allows you to rotate digital camera videos made in portrait mode by 90 degrees. 1. 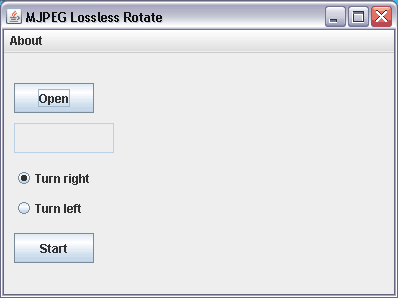 Download MJPEG Lossless Rotate program. 2. Unzip the download file, Start the program (java based file). 3. Click Open to select the video file. 4. Select among “Turn Left” or “Turn Right” & click Start button. Works fine for me, thankyou!! Doesn’t work I’m terribly sorry. The output file is somewhat mangled. Full comments on sourceforge site. That said, please keep developing this tool, it is needed.